I take quiet walks in the morning, like changing the channel on the TV; it helps to change my life. There other morning, walking in front of the Pan Pacific Hotel, a majestic, what would be my first pick for classy Hotel if I had any to pay for class, I stop as I pass some feet and take a pause. First, look, these were just feet. 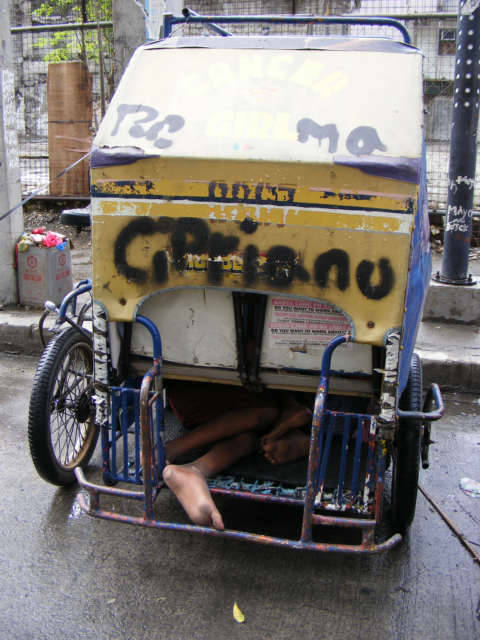 On second glance, a pause, time for my brain to understand, there is an adult with a child sleeping in the bicycle taxi here in Manila, they are painful feet to me; it is about 6:30 on a bright sunny day, I wonder how long they will sleep. Walking back to the Hotel, using the road because there is just too much of too much on the sidewalk, like an obstacle course. I look over to my right, I am trying to walk through the obstacles, when along side me is maybe a 3 years old girls, plat plat plat as here bare feet smack the sidewalk as she runs along side of me begging. The girl was precious, I did not have enough energy to take that photo, it would just take too much of too much.